Strangers, what do you want, coming here? People keep coming and coming. Well, death never comes for no reason, there’s always a reason. Death will find a reason. He burned alive on his vegetable patch, among his cucumbers… Poured acetone over his head and lit a match. I was sitting here watching TV when suddenly I heard screaming. An old person’s voice… a familiar voice, like Sashka’s… and then another, younger voice. A student had been walking past, there’s a technical college nearby, and there he was, a man on fire. What can you say! He ran over, started trying to put him out. Got burned himself. By the time I got outside, Sashka was on the ground, moaning… his head all yellow… You’re not from around here, what do you care? What do you need a stranger’s grief for? Everyone wants a good look at death. Ooh! Well... In our village, where I lived with my parents before I was married, there was an old man who liked to come and watch people die. The women would shame him and chase him away: ‘Shoo, devil!’ but he’d just sit there. He ended up living a long time. Maybe he really was a devil! How can you watch? Where do you look… in what direction? After death, there is nothing. You die and that’s it – they bury you. But when you’re alive, even if you’re unhappy, you can walk around in the breeze or stroll through the garden. When the spirit leaves, there’s no person left, just the dirt. The spirit is the spirit and everything else is just dirt. Dirt and nothing else. Some die in the cradle, others live until their hair goes grey. Happy people don’t want to die… and those who are loved don’t want to die, either. They beg to stay on longer. But where are these happy people? On the radio, they’d said that after the war was over, we would all be happy, and Khrushchev, I remember, promised… he said that communism would soon be upon us. Gorbachev swore it, too, and he spoke so beautifully… it had sounded so good. Now Yeltsin’s making the same promises. He even threatened to lie down on the train tracks… I waited and waited for the good life to come. When I was little, I waited for it… and then when I got a little older… Now I’m old. To make a long story short, everyone lied and things only ever got worse. Wait and see, wait and suffer. Wait and see… My husband died. He went out, collapsed, and that was that – his heart stopped. You couldn’t measure it or weigh it, all the trouble we’ve seen. But here I am, still alive. Living. My children all scattered: my son is in Novosibirsk, and my daughter stayed in Riga with her family, which, nowadays, means that she lives abroad. In a foreign country. They don’t even speak Russian there any more. We die how we lived… I even go to church and wear a little cross, but there has never been any joy in my life, and there isn’t any now. I never got any happiness. And now even praying won’t help. I just hope that I get to die soon… I hope the heavenly kingdom hurries up and comes, I’m sick of waiting. Just like Sashka… He’s in the graveyard now, resting. [She crosses herself.] They buried him with music, with tears. Everyone wept. Many tears are shed on that day, people feel sorry for you. But what’s the point of repenting? Who can hear us after death? All that’s left of him are two rooms in a barracks house, a vegetable patch, some red certificates, and a medal: ‘Victor of Socialist Emulation’. I have a medal just like that in my cabinet. I was a Stakhanovite* and a deputy. There wasn’t always enough to eat, but there were plenty of red certificates. They’d hand you one and take your picture. Three families live together in this barracks. We moved in when we were young, we thought it would only be for a year or two, but we ended up spending our entire lives here. And we’ll die in this barracks, too. For twenty, for thirty years… people were on the waiting list for an apartment, putting up with this… Then, one day, Gaidar comes and laughs in our faces: Go ahead and buy one! With what money? Our money evaporated… one reform, then another… We were robbed! What a country they flushed down the toilet! Every family had had two little rooms, a small shed, and a vegetable patch. We were exactly the same. Look at all the money we made! We’re rich! We spent our whole lives believing that one day, we would all live well. It was a lie! A great big lie! And our lives… better not to remember what they were like… We endured, worked and suffered. Now we’re not even living any more, we’re just waiting out our final days. 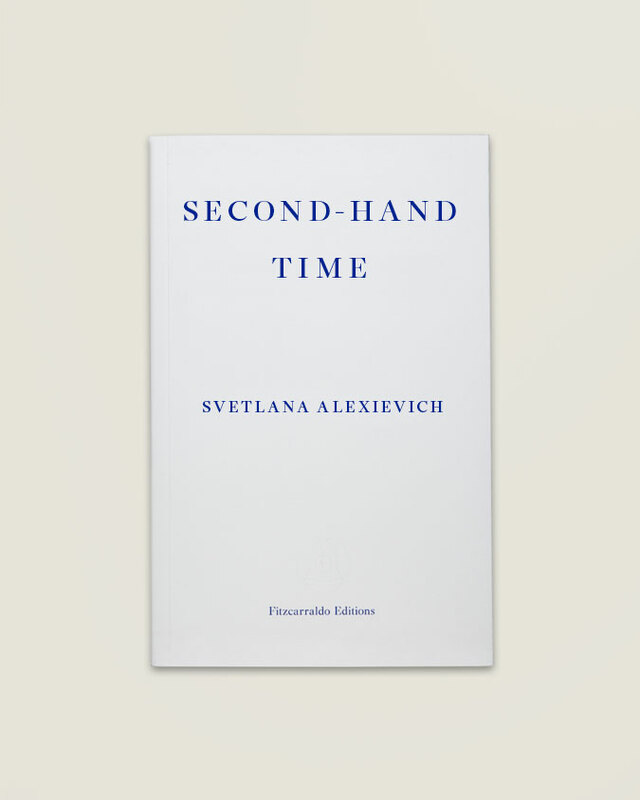 Second-hand Time is the latest work from Svetlana Alexievich, winner of the 2015 Nobel Prize in Literature. Here she brings together the voices of dozens of witnesses to the collapse of the USSR in a formidable attempt to chart the disappearance of a culture and to surmise what new kind of man may emerge from the rubble. Fashioning a singular, polyphonic literary form by combining extended individual monologues with a collage of voices, Alexievich creates a magnificent requiem to a civilization in ruins, a brilliant, poignant and unique portrait of post-Soviet society out of the stories of ordinary women and men. Bela Shayevich is a Soviet-American artist and translator.